In order to properly cool a high powered aircraft engine we developed a completely new cylinder head with integral coolant jacket. We spent almost 7 years working out the design details. This new cylinder head incorporates proprietary design techniques based on over 30 years of experience designing liquid cooled cylinder heads for high performance racing engines putting out 800HP and more. The coolant jacket is designed to ensure that the hot sections of the cylinder head are properly cooled and that flash boiling and steam pockets do not occur inside the coolant jacket. However, we did more than simply design a proper high performance cylinder head and coolant jacket. We also wanted to make sure that we would obtain the maximum performance possible from the engine. We took a stock air cooled cylinder head to our porting specialist and told him to go all out in improving the intake and exhaust ports. We then cast the results of his work in our head. If you are building a top performing engine you can be assured that our intake and exhaust ports are as good as any professional porting specialist could possibly make them - its unlikely that any further porting of our heads would yield any additional benefits. 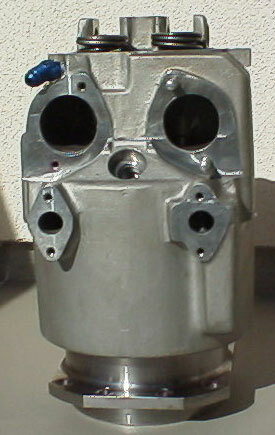 The coolant jacket/cylinder head is a 'dry sleeve' design. 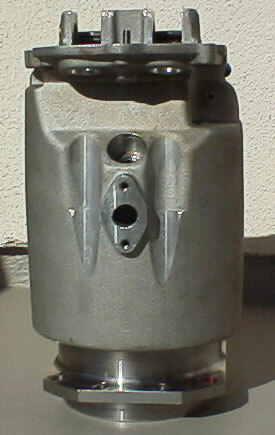 All of the coolant is contained entirely within a single aluminum casting. This design prevents the coolant from coming in direct contact with the steel cylinder liner thus avoiding any possibility of galvanic corrosion caused as a result of conductivity by the coolant between the two dissimilar metals. Furthermore no seals are required between the coolant jacket and steel liner eliminating a possible source of coolant leakage. Our design continues to use a well established method of joining the cylinder liner with the cylinder head by use of an interference threading between the two components. 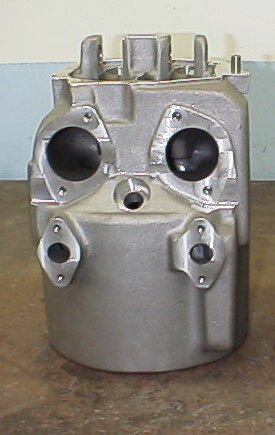 The result is a strong and solid assembly on par with the air cooled version of the cylinder.